I know this week's meme is a little late but I have actually been doing work at work, I have countless projects that I am working on simulataneously and with this being the last week of school, someone has summeritis. Don't worry, he's been sprayed. And, when I went to take the pictures, the batteries in the digital camera were dead....That always happens! ugh! This week [June 5th] we are visiting our work areas, the foundation of our muses, our studios! Yes, that's right STUDIO. 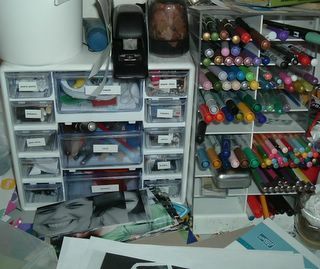 Any artist's working area is a studio. Even if it's a kitchen table or in a closet. Share with us that place of inspiration where you create your pages. Get out your camera and share that spot with us. RULE- DON'T CLEAN UP! Just take it as it appears at this moment. A perfectly neat studio is a sure sign that no work is being done. And as I designed a shirt to say, "A Creative Mess is preferable to idle neatness. [Scrapbook Mantra]" Amen? LOL! Inspiration is what sparks creativity. And creativity is the spark for rooms with personality. How is your personality in your space? "We all get inspiration in various ways. For you, it may be the where you live. Living near the ocean, for instance, might mean that you begin to add elements of that environment. Or, it could be a hobby (trains, collecting ironstone, making birdhouses), or possibly an interest in a particular style of decorating (casual, formal, country French, or tropical chic). Whatever your inspiration, you can creatively incorporate it into your home." Do you have fun ways to display your supplies? Is your area funky or functional? Comfortable or straight laced? What a great way to share ourselves by sharing where we create our art. Sark writes about her tiny cottage "I write all of my books lying down on a futon beneath the loft bed, surrounded by books, cards, quotes, divinations, affirmations, magnifying glasses, bits of dyed string, special shells, sparkling rocks, photos and cigar boxes full of fascinations. There are shelves of journals and wind chimes, their sounds follow me everywhere." Pretty cool huh? I want my studio to be full of special little hints of me. First rule, no cleaning up... No problem! But look at that mess! Unfortunately, this room is a walk thu to the upstairs bedrooms, so many things find a home in this room. It is what I refer to as the Catch All. I like the room though, I am not that secluded and I have everything I need right at my fingertips. It is pretty well organized. Every drawer is labeled, in case someone has a scrapbook emergency one day and I am not home to tell them where the eyelets are. 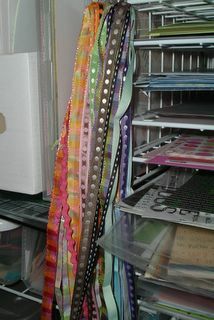 All the 8.5x11 cardstock is in magazine holders on the wire cube contraption, they are sorted by the rainbow. The 12x12 cardstock is stored flat by color and the patterned paper is sorted by manufacturer and then by line if necessary. On the wall to the right of my desk is a wipe off magnetic board, but is not nearly large enough. I put up inspiration on that and switch it out. My ribbon is now a decoration in the room. They used to be store on cards in a drawer like my fibers, but they were getting kinked. I used safety pins and sorted them by color and or manufacturer and then looped the pins onto a jump ring hoop from the office store. Saw this on 2peas somewhere, I am not clever to think of it myself. I love it, I can turn around and snip off a bit as I need. 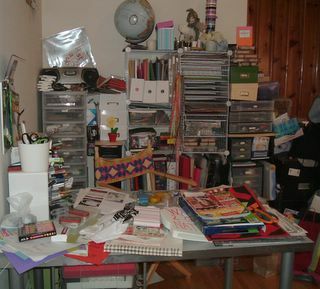 You area isn't cluttered, it's creative! LOL! i am so with you on the "catch all" business...i have quite a few areas with that problem..
thanks for the links- those rooms were cool! I love what you did with the ribbon! I hear you about the catch all thing - mine too! great space!!! looks like you are very creative there!